What exactly is a Buddha bowl? We think it's a healthy grain bowl with vibrant toppings. Did it get its name because it's supposed to make you feel all enlightened and zen after eating it? We're not sure but we've got an easy recipe for Buddha bowls that are nutritious and taste amazing. 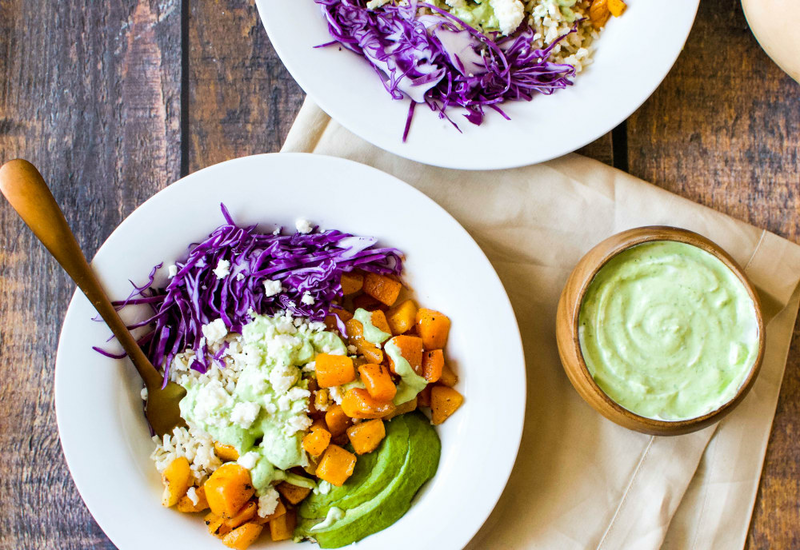 This version features brown rice, roasted butternut squash, red cabbage, and avocado topped with with an herb-spiked Greek yogurt sauce. It's ready in less than half an hour but tack on a few extra minutes because these Buddha bowls are so beautiful that you're going to want an in-depth Instagram sesh with them. The beauty of Buddha bowls is their versatility (and all the colorful toppings). Use your favorite grain or squash variety to put this meal together. You could use quinoa, barley, or faro. Try it with kabocha or delicata squash. Aha! Maybe it's called a Buddha bowl because you're not supposed to stress about it. Per Serving: 890 calories; 43g fat; 113.2g carbohydrates; 23g protein; 40mg cholesterol; 1077mg sodium. Love this buddha bowl! So hearty and delicious! Such a perfect way to use the pre-chopped butternut squash at the grocery store. This is an easy recipe and tastes amazing. I also really love the green yogurt herb sauce. These brown rice bowls were really good. I never used to like roasted butternut squash but now I can't get enough of it. This recipe makes two generous portions, that can also be divided into four light bowls. I'll be making this again soon. Love throwing together these quick and easy grain bowls. I skipped the feta cheese, but other than that followed the recipe. This makes a lot of sauce, so I saved the rest in put it in the fridge. I'll probably use it on a salad. This is my favorite vegetarian post-workout meal. I replaced the purple cabbage with kale, and substituted the yogurt sauce with a homemade vinaigrette. Really delicious. Really good grain bowl, but I used quinoa instead of brown rice. I also added some water to thin out the sauce some. I put this together really quickly, and used pre-cut squash from the store.